Are you planning an upcoming meeting, training or short seminar that requires interpreting services? If you are, you may be asking yourself a common question: Do I need one interpreter or two? If you read my hint above, then you have my short answer. However, there are some instances when using just one interpreter is enough. The first thing you must do is to determine the specifics of the interpreting project. Ask what will the interpreting be needed for, who needs the interpreting and under what circumstances. Having an understanding of the details will help you decide how many interpreters you will need. What Is The Purpose Of The Interpreted Event? The type of event will determine the number of interpreters you will need. Is it a conference? A visit to a client site? A negotiation? A meeting? The size of the event may help dictate how many interpreters you will need. For example, if there are five people having informal meetings in a small conference room then two interpreters may seem overwhelming. In this case, one interpreter might be appropriate, especially if there are no presentations. Smaller, more informal encounters may be best with just one interpreter; whereas larger presentations and trainings are better suited to using multiple interpreters. What Kinds Of Interpreted Communication Will Be Happening? The type of communication happening at your event will also help you decide on the number of interpreters you will need. Will there be a presentation from 8am—10am, then breakout groups from 10—12, then lunch, then 2 sessions in the afternoon, and small groups again? Will it be straight presentations from 8am—5pm conference-style? Will it be a client office tour from 9—11, then lunch, then negotiations from 1—3? Will interpreting be bidirectional, with people of different language pairs conversing, or one person giving all the information with others receiving it? If it will be a mix of these styles, what percentage of the time? Smaller group sessions may require just one interpreter and larger conferences will need multiple interpreters. Also, interpreting is easier when it is just individuals talking rather than when someone is giving a speech. The bidirectional conversations may be better matched with just one consecutive interpreter, while speeches or “talking heads” are better with multiple interpreters performing simultaneous interpreting. How Much Break Time For The Interpreter(s) Will There Be? In both simultaneous and consecutive interpreting, the interpreter will need breaks equal to half of the time they are present. That means that one 5- or 10-minute break per hour is not enough. In other words, the breaks that meeting participants get will not be sufficient for an interpreter. To make a decision about whether one or two interpreters are needed, think about the rough ratio of 20 minutes on, 20 minutes off. That is a LOT of breaks and if the meeting planners have a lot of information to cover, they may be best served with two interpreters. Interpreting is mentally taxing. Studies show that after 20 minutes interpreting, no matter how much of an expert the interpreter is, they will begin to slip and lose information. Break time needs to be built into the schedule. If break time cannot be worked into the schedule, TWO interpreters are needed. Interpreter will provide consecutive interpretation for approximately 4 hours of meetings, tours, etc. as well as a dinner, if needed. Because only one interpreter will be present, while consecutive interpreters generally work in pairs, sufficient breaks must be provided to allow the interpreter to provide accurate interpretation and conform to the standards of the interpreting profession. Having expectations clearly outlined for both the interpreter and the meeting planners best sets you up to succeed. It also sets the anticipation that the interpreter will work for set times and have set breaks, clearing up any confusions or misunderstandings from the beginning. Knowing the details about your event helps you resolve the number of interpreters you will need. However, remember the hint above. When in doubt, always use a minimum of two interpreters. Click here for our blog on the 6 Major Types of Interpreting, an exploration of the different types of interpreting to help you determine the type of interpreting that will best suit your needs. 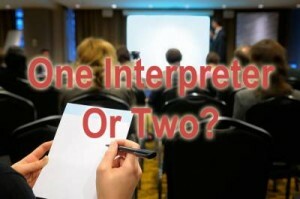 What experiences have you had with using one versus two interpreters? Please share your experiences below in our comments sections. Also, please kindly like and share this blog socially so that your network can also benefit from this blog.